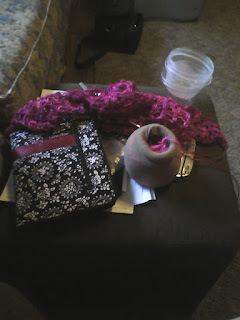 G's Crafts n' Things: Easy cheap yarn sacks. I do love my knitted yarn sacks. But let's face it, if I spend all my time knitting cozies for my yarn I won't have as much time to knit/crochet with all the yarn in knitted cozies! So I went to the lingerie section of the store where they sell stockings and bought one of those big packs of knee high stockings. You get a bunch in a box and they're cheap. Bonus is if you wear them, this is a great use for the ones that are either mismatched or have runs in them. You can also cut the feet off the full stockings you can't wear anymore. You can then place your center pull cakes and skiens inside the stocking and it will help hold it together as you work and it gets floppy as the nylon will compress the yarn. It's also great to protect those super soft and delicate yarns that can get nappy from being taken out and stufed back into your project bag. It also keeps it clean oif it falls on the floor.